Magnaflow catalytic converters from Car Sound have a ribbed body that minimizes expansion and distortion when the converter heats up. The ribs form a channel that protects the cushioning mat from direct exposure to exhaust gasses and they hold the ceramic catalyst in proper alignment. Magnaflow catalytic converters from Car Sound have a 1/2” lap-joint where the necks meet the body. The neck does not extend into the converter body where it could hamper exhaust flow. This is the strongest and smoothest flowing inlet/outlet joint of any manufacturer. Magnaflow Car Sound maintains separate dies on different sized inlets. They don’t skimp by putting larger neck sizes on smaller bodies. 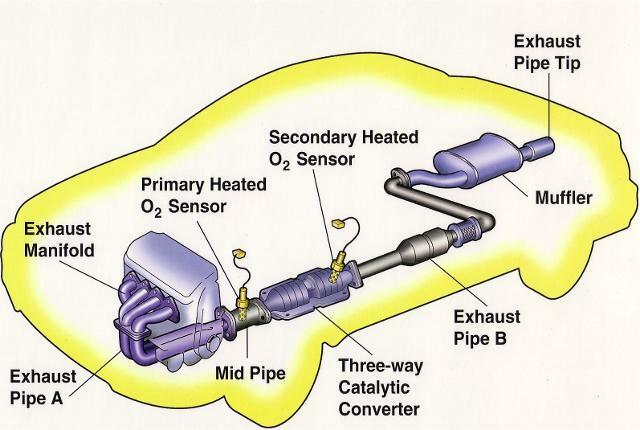 This would reduce the flow of the converter and reduce the quality of the catalytic converter. Magnaflow uses a monolithic honeycomb catalyst. The ceramic is designed for maximum flow and surface area. The coating method is strictly controlled to maintain exact specifications. An improper coating could result in flow restrictions or an emission test failure. Magnaflow uses a heavier gauge stainless steel, tip to tip. Other manufacturers use mixed weights and materials. Magnaflow catalytic converters from Car Sound are seam welded close to the converter body for a strong, tight bond. Magnaflow doesn’t weld along the edge, which could allow the converter to expand like the folds in an accordion, allowing the catalyst to move around. Magnaflow installs a factory capped, 90 degree air tube on “with air” converters. This saves time during installation. There is no need for additional labor to weld on an air tube or to create a bend when only an air tube stub is provided. 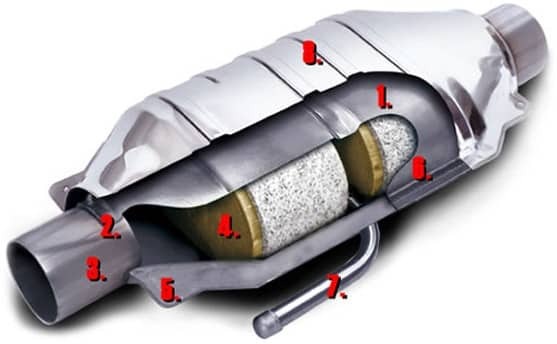 Magnaflow uses an aluminized or stainless OEM-style ribbed heat shield on its Car Sound catalytic converters that creates a rigid wall of protection against heat and adds to the structural stability of the converter.